On a recent drive around the area, I was pleasantly surprised to see this sign at the Brant Pines Ski Area north of Grantsburg. 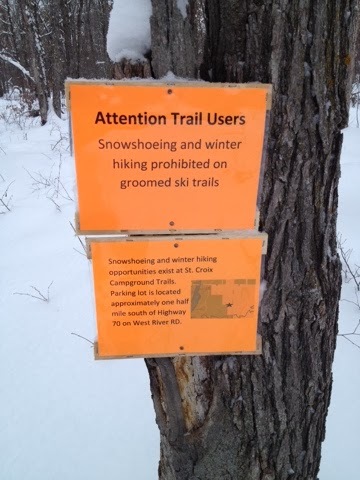 The DNR are grooming the cross country ski trails this year. Last year they suspended grooming due to budget cuts. Since the trails were not groomed last year there was no fee to use them. But, nobody used them since they were not groomed. It's nice to see this year that the DNR figured out that cutting programs that actually generate revenue is not a good idea. The decision to not groom the trails appeared to be another example of politicians and bureaucrats making their budget fights public. You see this all the time. When schools are asked to cut their budget, they threaten the public that they will be forced to lay off teachers; but some how they still have the money to buy the football team new practice jerseys. When cities are asked to cut their budget, they threaten the public that firefighters and police officers will be let go; but on Saturday mornings you'll still see two city maintenance workers watering the flowers that hang in baskets from the light poles on main street. And that is the game the politicians and bureaucrats play; target something the public sees for budget cuts while ignoring the fat that could be trimmed. If you want more examples, just look back at the recent Federal Government shutdown. Have Yourself a Crumbled Little Christmas.